The Monks: Caption this photo and win copies of their new Light In Attic releases! 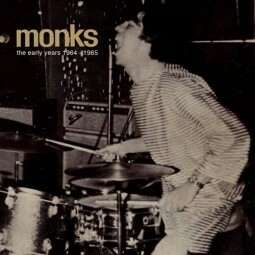 The Monks were five beat playing American GIs stationed in Germany who, after their discharge, decided to stay and continue their musical mission. Meeting up with a team of local managers, they transformed themselves and their sound into a holy racket like the world had never known. This five-person order literally birthed the above genres through a fuzz-drenched evolution of sound, bursting with social commentary and future primitive rhythms. These are the definitive releases of these classic albums. Numerous period photographs (many unseen) and an extensive two-part essay by Canadian music journalist Kevin Howes (Rodriguez – Cold Fact, Jamaica – Toronto series) accompany both releases and tell the Monks story like it has never been told. Bonus material dating back to pre-Monks Torquays and up to post Black Monk Time 7″s are also included. 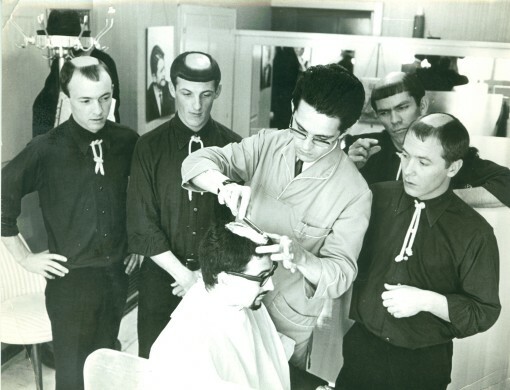 In celebration of the re-release of these classic albums, I’m giving away a copy of Black Monk Time and The Early Years 1964-1965 to the two readers who send me the best caption for the above photograph of The Monks. Send your entries to contests@bumpershine.com, lucky winners (who will get one CD each) will be picked on Wednesday, April 22. Full track listings and cover art after the jump.